Do You Have The Millionaire Mindset? Let’s break it down further… Desire – Wanting something better. Dissatisfaction – Not settling for what you have or where you’re at. Demand – The point of no return, where you make the change, no matter what. Vision – What you want. Plan – How you intend to get there. Cost of Change – Your perception of what it’ll cost you in terms of time, energy, money, etc. to make the change. Usually the PERCEIVED cost of change is greater than the true cost (…that’s important!). 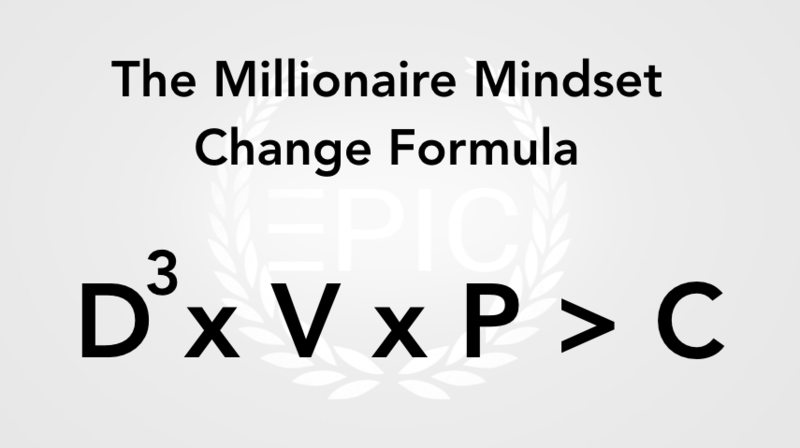 Most people can have every component of this formula in place except for the DEMAND, and they’ll still never get “there”, wherever there is for them. Why? Because until you demand the change of yourself you’ll allow yourself to stay where you are. Plain and simple. Which brings me back to my conversation.